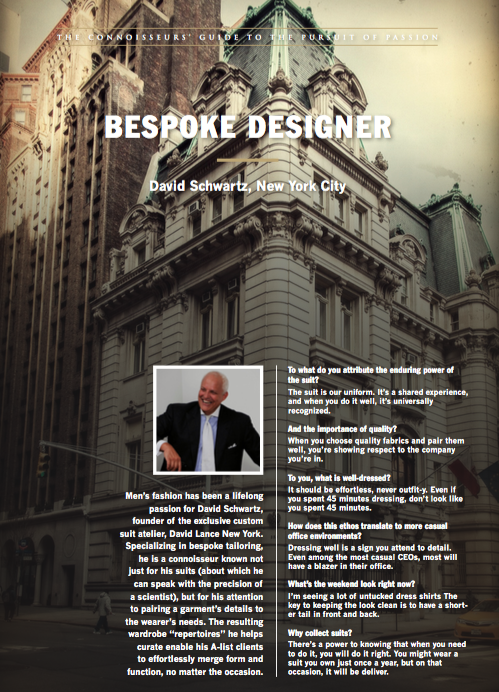 Men’s fashion has been a lifelong passion for David Schwartz, founder of the exclusive custom suit atelier, David Lance New York. Specializing in bespoke tailoring, he is a connoisseur known not just for his suits (about which he can speak with the precision of a scientist), but for his attention to pairing a garment's details to the wearer's needs. The resulting wardrobe "repertoires" he helps curate enable his A-list clients to effortlessly merge form and function, no matter the occasion. To what do you attribute the enduring power of the suit? The suit is our uniform. It’s a shared experience, and when you do it well, it’s universally recognized. And the importance of quality? When you choose quality fabrics and pair them well, you’re showing respect to the company you’re in. To you, what is well-dressed? It should be effortless, never outfit-y. Even if you spent 45 minutes dressing, don’t look like you spent 45 minutes. How does this ethos translate to more casual office environments? Dressing well is a sign you attend to detail. Even among the most casual CEOs, most will have a blazer in their office. What’s the weekend look right now? I’m seeing a lot of untucked dress shirts The key to keeping the look clean is to have a short- er tail in front and back. There’s a power to knowing that when you need to do it, you will do it right. You might wear a suit you own just once a year, but on that occasion, it will be deliver.